Having just opened a couple weeks ago, this new poke spot on University Avenue has become a great campus edition. Poke It Up even offers a modern twist on the classic poke bowl with the choice of a burrito instead! On Monroe Street, Miko Poke is a short drive from campus, but offers great fish and veggie options. Try their flavored Hawaiian shaved ice for a sweet treat after your bowl! If you don’t feel like leaving your apartment, you can even order your meal for delivery via EatStreet. 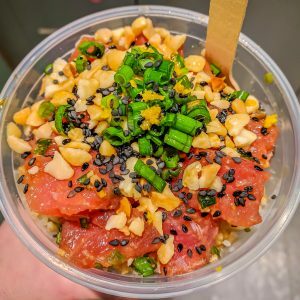 At the center of off-campus dining, this new poke spot on State Street offers the classic build your own poke bowl. Unlike the other spots, Poke Plus & Teriyaki even offers the option of cooked teriyaki dishes. With delicious toppings and flavors, this is sure to be a convenient and healthy spot all year-round! On Williamson Street, this fairly new poke restaurant offers a range of ingredients for all the bowls. For dessert, they even offer various flavors of mochi, including strawberry, mango, green tea, red bean, or chocolate.